No one goes further to get guests closer to the destinations where Windstar sails. An incredible cruise like our 51-day Grand Mediterranean cruise on Wind Surf, the world's largest sailing ship, is exactly what people who love to travel live for. Cruise guests on Windstar’s 51-day Grand Mediterranean adventure will embark the 310-passenger MSY Wind Surf on July 7, 2019, in Europe’s Westernmost port of Lisbon, Portugal, prepared for an epic adventure visiting the best ports in central Europe sailing across the culturally-rich Mediterranean, one of the world’s most beautiful seas. 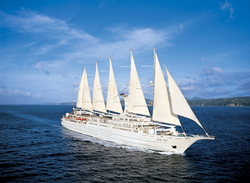 An equal match, the majestic Wind Surf is the world’s largest sailing ship at 14,745 gross tons, 617 feet in length with 26,881 square feet of crisp new sails soaring 220 feet skyward. The ship will traverse the vast inland ocean during the cruise high-season on a comprehensive Mediterranean voyage. The cruise will call at popular ports and hidden harbors in Portugal, Spain, Gibraltar, Malta and Italy, sailing to the farther reaches of Croatia, Montenegro, Greece and Turkey, and then doubling back for more cultural immersion and travel delights in Monaco and France before landing in Barcelona on August 27, 2018; all told, eight weeks of once-in-a-lifetime discovery spanning nearly 9,500 nautical miles. Travelers aboard Wind Surf will be immersed in the romance of travel by sea and sail, cruising into major cosmopolitan cities such as Rome and Athens, and gliding into impossibly quaint harbors to mirror the towering town spires of coastal gems like Sanary-sur-Mer, France and Rovinj, Croatia. Windstar’s curated collection of shore excursions provides cruisers with hundreds of choices that span the spectrum from docent-led tours to Picasso’s Museum in Málaga to ocean kayaking in Palma de Mallorca or pesto-making lessons in Portofino. The ship’s Captain will introduce present-day explorers to Windstar’s unique Open Bridge, sharing nautical charts and marine weather reports, a novel concept, only for those on cruise ships of a certain size and stature. While the ship’s innovative Water Sports Platform gives new meaning to a view from the water; when anchored cruisers can dive into the Mediterranean to play with complimentary water toys, stand-up paddle boards and water skis. The 51-day sailing is a marquis cruise; part of Windstar’s popular Star Collectors Voyages that combine shorter sailings and includes a FREE Laundry Package for each stateroom and suite throughout the cruise, a real benefit on a long sailing. The two month Grand Mediterranean cruise on Wind Surf encompasses six cruise itineraries varying from seven to ten days in length that are linked together to create this blockbuster journey across the Mediterranean. Kicking off with the 8-day Spanish Symphony from Lisbon to Barcelona, regional styles and influences of culture and flavors overlap as Andalusian tastes transform into Riviera glamour followed by Italian chic, serene Greece and colorful Turkey. Key regions visited on the impressive tour of the Mediterranean include the French and Italian Rivieras, the islands of Spain, and the islands and coastal ports of the Adriatic and Aegean Seas. The ten countries visited over the course of the summer’s ultimate itinerary include Portugal, the British Territory of Gibraltar, France, Monaco, Italy, Croatia, Montenegro, Malta, Greece and Turkey. The mix of 42 ports is evenly distributed based on country size and offers a thoughtful balance of large port cities that have it all and small towns brimming with personality. In 2019, the Wind Surf will offer a total of 44 cruises visiting European ports from April through November including the epic Grand Mediterranean voyage, all itineraries are now open for reservations. To learn more about the 51-day Grand Mediterranean Star Collector Voyage, Windstar’s partnership as the Official Cruise Line of the James Beard Foundation, and authentic small ship cruising with Windstar, contact a travel professional or Windstar Cruises by phone at 877-958-7718, email info(at)windstarcruises.com or visit http://www.windstarcruises.com. Windstar Cruises operates a six-ship fleet of small sailing and all-suite ships visiting approximately 270 ports annually sailing throughout Europe, the Caribbean, Costa Rica and the Panama Canal, Asia, Alaska, Canada and New England, and cruising year-round in Tahiti. Windstar’s fleet is the market leader in small ship cruising with a total of 1,242 passenger berths calling on off-the-beaten-path and popular ports in over 60 countries. The boutique cruise line carries fewer than 310 passengers on its small ships and takes travelers on cruises that are 180 degrees from ordinary. They are known for their immersive and authentic experiences, unique, port-intensive itineraries, exceptional award-winning service, and innovative culinary program as the Official Cruise Line of the James Beard Foundation. Windstar Cruises is a part of Xanterra Travel Collection, an award-winning, globally diversified travel company offering once in a lifetime experiences in some of the most beautiful and iconic places on earth.